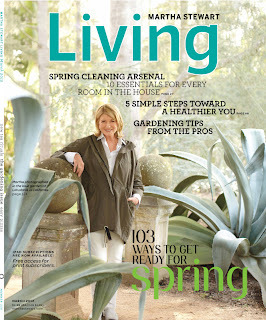 Homesteader’s Supply Pail Featured in Martha Stewart Magazine!!! Well, needless to say, Jerri completed the order and here we are several months later… and indeed our pail was featured on Page 27 of Martha Stewart Magazine March 2012 Issue!!! Notice the ‘103 ways to get ready for spring” on the cover… one of those ways is with a spring cleaning kit using our pail! We just had to share this great news, so I if you subscribe to Marta Stewart Magazine or pick one up at the local magazine stand… check out Page 27 and see how functional a good pail can be! This entry was posted in Homesteading, How-To on March 3, 2012 by Homesteader's Supply.